It’s a new year again, and you haven’t lost the weight. You’re not alone. Almost 70% of American adults are either overweight or obese, according to the Centers for Disease Control. Being overweight places you at a higher risk of serious diseases — heart disease, cancer, and diabetes, to name a few. Losing weight not only helps reduce your risk of illness; you also feel better overall and have more energy. There are many diets on the market today — Atkins, South Beach, keto … and the list goes on. Many people lose weight on diets, but then gain the weight back. Why? When you hear the word “diet,” you think of a temporary time period. You diet for a few months and take off the weight. But then the diet is over. You’re done. What do you do then? Many people gradually revert to old habits. Diets are often so restrictive that you can’t maintain them. Starving yourself or never having a favorite dessert again doesn’t work. Then there’s the feeling of failure. You can change the failure cycle by shedding the word “diet” and beginning to think instead in terms of healthy eating habits. Mountain Medical Arts can devise a customized nutrition and wellness plan for you and help support you as you start on a new journey — the road to better health. As a first step, your physician at Mountain Medical Arts reviews your medical history and orders lab tests to determine your hormone, vitamin, and nutrient levels. Your doctor asks you to keep a food journal of everything you eat over a period of several days. You also provide information on your normal activity level. Sometimes weight gain is a medical issue. Your doctor determines whether you have a thyroid or insulin imbalance, both of which can lead to weight gain. If your weight gain is from a medical cause, your physician can prescribe medication or may refer you to a specialist, depending on your diagnosis. Stress is also associated with weight gain. Prolonged stress produces excess cortisol, which in turn produces elevated insulin, causing your blood sugar to dip. Then you crave high-calorie, sugary foods. If you’re under long-term stress, your physician discusses ways to reduce your stress and provides resources to help you. Working with your Mountain Medical Arts physician, you learn how to eat more healthily. 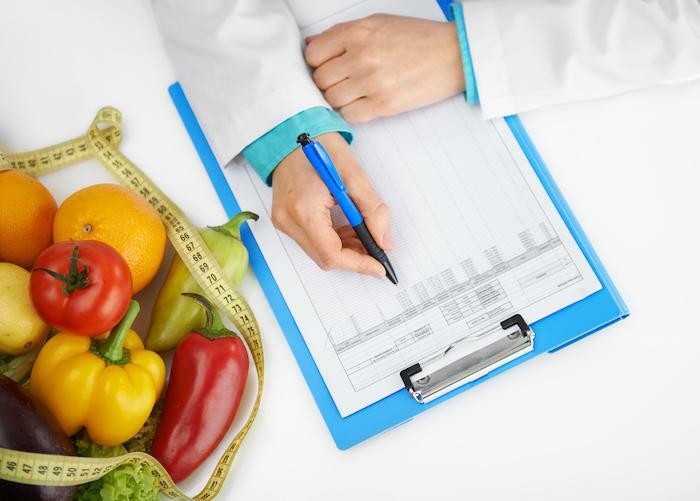 Your doctor devises a nutrition plan customized to your body’s needs. Getting smart about the food you eat and learning how your body reacts to it helps form healthier eating habits. For example, did you know that meat from farm animals raised on large agribusiness farms is often pumped up with antibiotics, hormones, steroids, and toxins? When you eat meat that has these substances, it increases the estrogen levels in your body and affects how you process insulin, leading to weight gain. Many of the foods in our restaurants and the processed foods in grocery stores are calorie-laden and lacking in healthy nutrients, but they taste really good. These foods often contain high fructose corn syrup (HFCS), which is artificial sugar. HFCS is linked to diabetes, heart disease, and the obesity problem in America. It’s in many of our everyday products, from soda to salad dressing to granola bars to cereal. Part of a nutrition plan is learning what to avoid in the grocery store and what to stock up on. You learn to steer clear of the aisles laden with candy and processed foods. It also means sticking to healthy portion sizes of the food you eat. American portion sizes are large. The size of dinner plates is 36% bigger now than in 1960. Plates today are 11 or 12 inches in diameter; they used to be 7-9 inches. Research shows when you eat on a smaller plate, you eat less. Part of the nutrition plan may be changing the size of your dinner plate; it’s a strategy that might work for you. Your doctor also incorporates an overall wellness strategy while you’re learning how to eat more healthily. Regular exercise, for example, isn’t only healthy, it can also lift your mood and create a sense of well-being. Exercise is part of the plan at Mountain Medical Arts. Instead of focusing on a short-term diet that you may not be able to sustain, Mountain Medical Arts helps you create healthy eating and exercise habits for the rest of your life. Call or book an appointment online with Mountain Medical Arts for holistic, personalized health care. TempSure firms your skin and reduces the appearance of cellulite to help you look sleeker, sexier and more toned. Treatments can be performed on your face and on your body - and if you start now, your skin will look great just in time for summer. With the ICON laser system, your laser hair removal treatments can be faster, more effective and more comfortable than ever. And the results can last a lifetime. Here's how it works. No sun? No problem. Glowing summer skin starts in the winter. Learn why you shouldn’t wait to start laser skin resurfacing treatments to achieve the glowing skin you desire.